The Good Place: Cancelled or Renewed for Season Three on NBC? What the fork? Is The Good Place TV show cancelled or renewed for a third season on NBC? The television vulture is watching the latest cancellation and renewal news, so this page is the place to track the status of The Good Place, season three. Bookmark it, or subscribe for the latest updates. Remember, the television vulture is watching your shows. Are you? 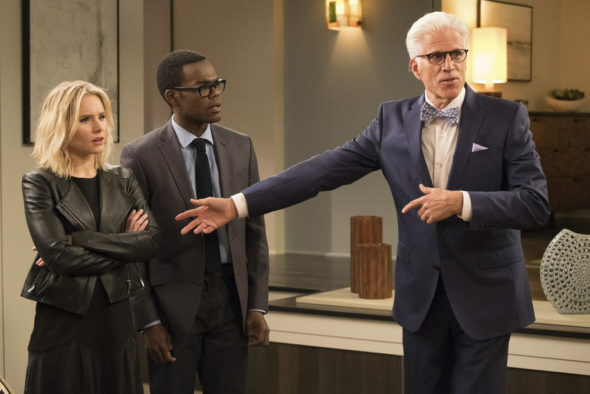 Airing on the NBC television network, The Good Place stars Ted Danson, Kristen Bell, William Jackson Harper, Jameela Jamil, Manny Jacinto, and D’Arcy Carden. The sitcom centers on the thoughtless Eleanor Shellstrop (Bell). After death, Eleanor mistakenly ends up in The Good Place — instead of The Bad Place, where she arguably belongs. With the help of her soulmate, Chidi (Harper), she tries to find her inner goodness (or at least decency). Meanwhile, they must keep her secret from Good Place architect Michael (Danson). In season two, everything is up in the air, after the events of the first season’s “world-upending” finale. The second season of The Good Place averaged a 1.14 rating in the 18-49 demographic and 3.88 million viewers. Compared to season one, that’s down by 16% and down by 18%, respectively. Compare its standing to the other NBC TV shows we are tracking. On November 21, 2017, The Good Place was renewed for a third season, which debuts September 27, 2018. Stay tuned for further updates. The ratings have been pretty steady so, I predict The Good Place will snag a third season renewal, but I reserve the right to change my mind if its numbers tank. For now, I’ll keep a hungry eye on the Nielsens and update this page with breaking developments. Subscribe for free updates on any cancellation or renewal news regarding The Good Place. 11/21/2018 update: The Good Place has been renewed for season three on NBC. Details here. 6/19/2018 update: The third season of The Good Place premieres on September 27, 2018. Details here. Read other The Good Place TV series news or other NBC TV show news. What do you think? Should NBC cancel or renew The Good Place TV series for season three? How many seasons do you imagine this TV show can last? SNL: Weekend Update Summer Edition: Cancelled or Renewed for Season Two on NBC? The Good Place is an amazing show. Everyone I show it to falls in love and will watch every episode in one night! I think the episodes since October 19th have been much better than the show has ever been. I suspect there are new writers. If they remain this funny, we would watch another season. I would love to see The Good Place renewed.